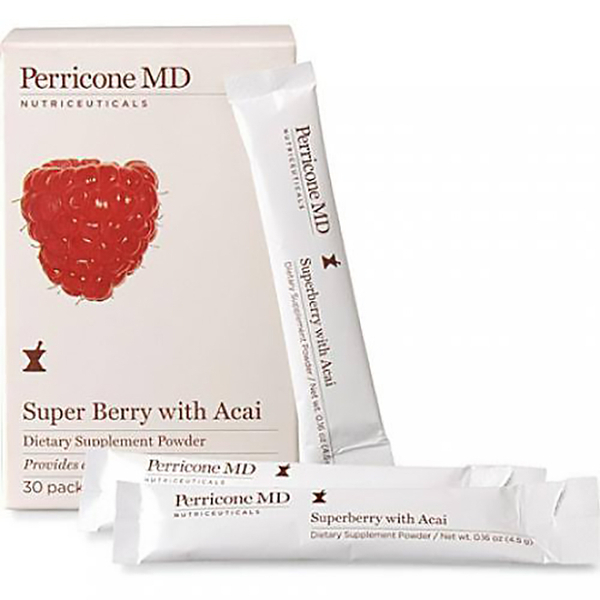 Treat your body to Perricone MD's Superberry Supplement, a natural, energy boosting supplement that works to boost your immune system and combat cellular inflammation. The fruity berry powder combines a cocktail of 'bright berries', including blueberries, raspberries, blackberries, cranberries and acai, and delivers effective antioxidant protection whilst maintaining cell health and supporting major organ functions. Perfect for adding to water, smoothies or yoghurt, the delicious blend will help protect from free radical attacks whilst providing a much needed, caffeine-free, pick-me-up. Raspberry, Blackberry and Cranberry – Phytonutrients provide fruits with their vibrant colours and are proven to provide antioxidant and anti-inflammatory benefits. Blueberry - Rich in anti-ageing antioxidants that fight free radicals and speed up brain communication. Acia - A superfood packed full of antioxidants, fats and dietary fibre for a healthy digestive system. (This pack contains a 30 day serving). Mix 1 scoop with a large glass of water. Drink as frequently as desired, or simply add to smoothies, warm water or yoghurt.